"The harp, the instrument of angels, presents a perfect paradigm for linking heaven and earth, the arts and sciences, as well as body, mind and spirit. The sonorous sounds of the harp, and the marriage of its historical legacy as a divine, archetypal instrument of healing – with high-tech amplification, has given birth to a new type of vibroacoustic therapy – Vibroacoustic Harp Therapy." Vibroacoustic Harp Therapy® (VAHT) works by vibrating and resonating with the tissues of the body, thereby affecting physiological processes. It also affects the mental, emotional and energetic or spiritual aspects of the individual. The harp’s wide range of frequencies and overtones are capable of vibrating the dense, physical body as well as its energetic counterpart, providing multilevel stimulation and harmonization. In this 3-DVD documentary, VAHT expert Sarjane Williams, M.A., a licensed psychologist and accomplished author, accounts the utilization of VAHT on clients with various symptoms. 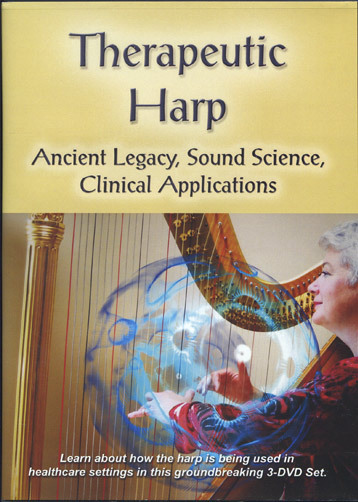 SaraJane Williams has produced an excellent 3-DVD set on Vibroacoustic Harp Therapy. The second disk in this program has several sections that I regularly use in my presentations, since they illustrate and very clearly explain the way sound propagates, and how music effects our physiology, from heart rate variability to brain chemistry (the latter, eloquently articulated by Abraham Kocheril, MD, former Professor of Medicine & Director of Clinical Electrophysiology at Univ. of IL, in Chicago)! Discover the history of the healing energy of harp music and how it has affected individuals and civilizations from the stone age to the 21st century. Understand the power of the plucked string and learn about its ancient mythical connections to modern consciousness and beliefs. Consider cutting edge theories about the effects of harp music on disease, mood and behavior. See how scientists are now able to measure many of these beneficial effects, integrating ongoing research in quantum physics, cymatics and medicine.